I sent off the Baby Life Ring socks and the hat that I designed to match with it’s little dreadlocks on top and the Grandmother-to-be loves them. Makes me so happy to please people with yarn-y wonderful-ness! And I have to be perfectly honest, the little hat is pretty stinkin’ cute! While visiting my college roommate here in Atlanta, I’ve finished knitting and embellishing the “This Little Piggy” hat that I designed for another friend’s granddaughter. 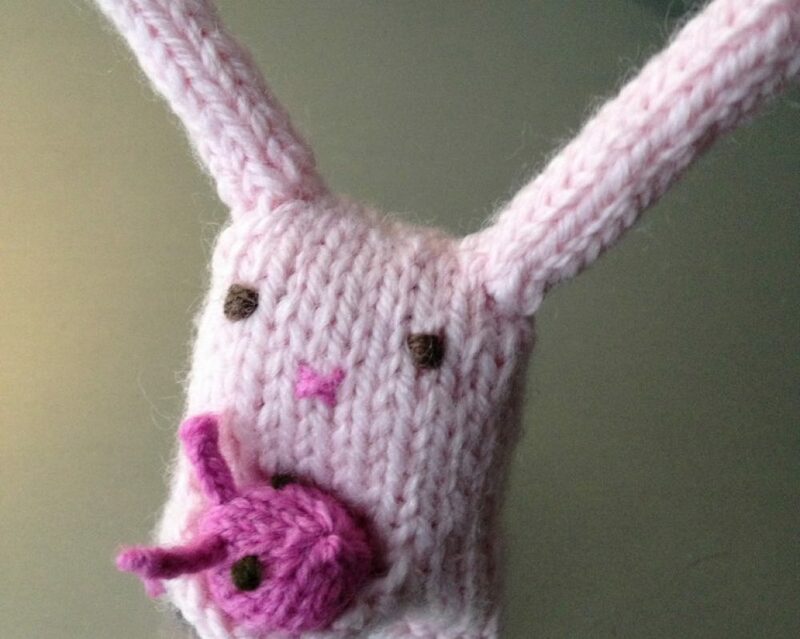 I’ve knitted up a pair of thumbless mittens to match. The pattern is called Stay Put Baby Mitts by Jillian Neary. It’s on Ravelry … of course! The pattern is really simple to knit up and since it’s knit in a worsted-weight yarn (at least that’s what I used), they knit up quickly. The little single-crochet “string” tie at the wrist keeps the mitts on the baby’s hands. The string attaching them together keeps them from falling off and getting lost. They’re not embroidered yet (they need to have cloven hooves) but they will be finished and sent out as soon as I am back in my southern atelier! The hat pattern will be joining my other originals on Ravelry when I get it test knitted. I am really pleased with the adorable piggy ears and it’s little curly tail. I giggle when I look at it because the pig’s face seems so quizzical … like it doesn’t know what to do – go to market or stay home! Next up, my Boxy Cardigan. Pattern and yarn by Seacolors Yarn. The process Seacolors uses is very unique. It’s hand-dyed with sea water, thus it’s name! The cardigan pattern is very simple and square. What makes it unique is color-blocking and I’ve purchased (after a long, long, long time wandering their booth at the Maine Fiber Frolic) some great colors that I’m very excited to see come together in this sweater! I’m already dreaming of buttons … they also will have to have been made in Maine! I started knitting with the US size 7 needles as the pattern suggests but have frogged that bit knitted up because it didn’t make the gauge. I’m starting again with my US size 8 needles and we’ll see how it goes! I’m knitting the large size. I’ve also had a request to knit up another top down baby sweater in the fabulous “Grateful Threads” colorway from Coveted Yarn. I am really excited about knitting with this yarn again! My tunic is still coming along. Knitting a ribbed stitch on US size 1 needles is slow going and very tedious so I have to break up that work with other projects. The construction of the tunic (it’s a Dropps design) is quite simple and the switch from the US size 6 needles in stockinette stitch to the 1×1 ribbing on US size 1 needles creates a bit of a gathered effect which is very pleasing. The back is nearly complete! I am so grateful for the friends and family who have encouraged me to follow my passion around knitting and I’m certain that the future holds all great things for my business as it grows right along with me! Gone knitting (in Atlanta), Y’all! Last week I made the mistake of bragging that we hadn’t been hit by the heatwave. Oops! I blew it. It’s hot here now … almost too hot to knit. I’m sure glad that I have no afghans or baby blankets on the needles! I’ve started a second pair of Baby Life Rings Socks by Cat Bordhi for a friend. They’ll be matched with a little hat. I think I will use the same idea as the socks and make a couple of life rings on the edge of the hat but will add a solid color in stripes. This little toe-up sock with a short row heel is just adorable. I “need” to buy some solid color yarns and see how they knit up in solid colors. I’ve chosen to use Cascade Fixation yarn in a colorway that’s lime green, pink and lavender. Mom’s favorite color is purple … and that may be my accent color in the hat. Baby’s due in late fall. My tunic is making slow progress in its second iteration. If you remember, I had the back nearly done when I realized that I was making the wrong size. Frogged and re-started. I still love the color. I’ve finished the Gaia Shoulder Hug shawl. I am not a huge fan of the Noro colorway that I chose but the finished product is nice and I think it will be a good addition to a plain white blouse in the fall and winter. The Noro wool started out scratchy and stiff but it softened up quite nicely through the knitting process and I’ve blocked it but without blocking wires. If I’m going to do lace knitting, I have to make an investment in blocking wires! My Maine Lobstah socks are coming along. Have gotten to the place where I need to turn the second heel. I will be happy to have them finished and start wearing them! This Little Piggie baby hat is coming along. I’ve put it away for a few days because I was getting frustrated with the design process. I have knit the ears five or six times and finally got them right. And then the snout was out of place. So, I have to re-knit the snout and then embroider some eyes and nostrils on it and knit the matching mittens. Fortunately, they’re a holiday gift and I still have time. I wish I had brought my swift and winder to Maine … I have some Buffalo Wool Company yarn that I want to knit into a lovely purple shawl using the falling leaves pattern (more information later!) And I have the yarn that I bought at the Maine Fiber Frolic and the cool and crazy pattern that I bought for that – it will be a cardigan for yours truly. There you have it. All this typing has made me hot … could be because my laptop is on my lap? !